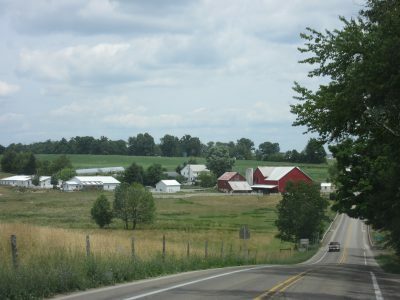 Nancy, my step-mom, happened to mention last week while we were visiting with her and Dad that there is a big Amish community in Ohio, so when we arrived at our campground, I inquired. 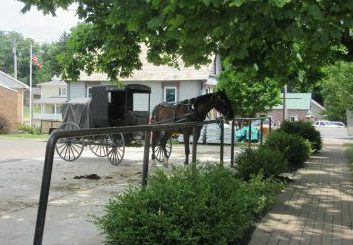 Sure enough, the office folks brought us a few travel brochures – one was on the Amish Country and one was on Lehman’s! 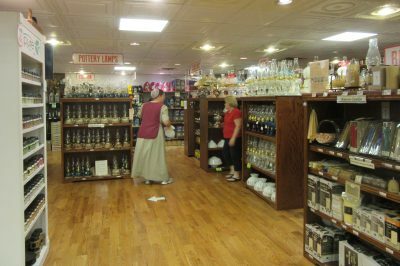 Lehman’s is a wonderful store that both caters to Amish and also carries Amish products. I’ve been ordering from them for years, so when I realized how close we are, I had to go to the actual store. 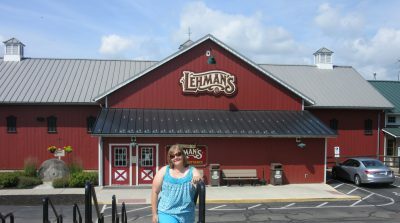 Through the brochures, we learned that Lehman’s, in the Kidron/Dalton, OH area, borders the northern section of the counties of Ohio known as” Amish Country,” so we had multiple reasons to explore on Wednesday, and our exploration carried over into Thursday also. Leaving the campground relatively early, we pointed the truck toward Lehman’s store. It was larger than I ever imagined, and walking through the store was an experience in and of itself. 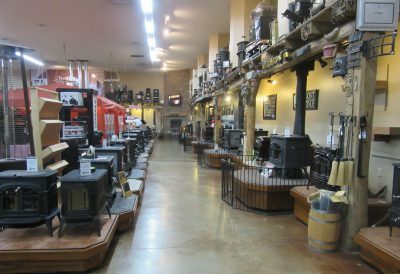 One of the amazing things is that the store building is actually a series of varies types and styles of existing buildings that had been merged over time into one. Look carefully, and you can see the multiple buildings joined. There are so many of the wood and gas heaters, I could not get even half in the picture. Then there were all of the other appliances and composting toilets, etc. 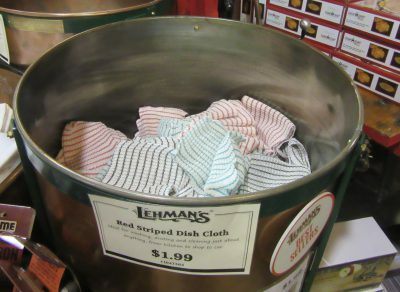 The very first thing I ordered from Lehman’s were these dish cloths. Back then, they only carried red and white, at least online. These cloths are made by an American company that has been in business for over 130 years. The cloths I purchased in 2007 are the same ones I am still using; they last FOREVER and don’t shrink. A pack of 6 (I think) is now $9.99 and worth every penny while supporting American workers. The dish cloths are the BEST! There are so many lamps, lamp shades, and other lighting options that once again, I could not get all in the picture. 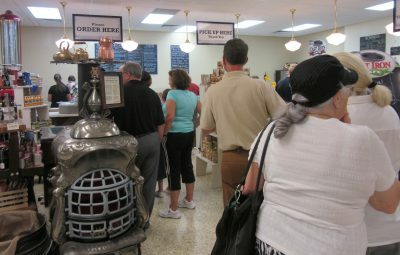 I was so hungry, and the entire area smelled heavenly, but I could not endure the long line. So, we checked out with our goodies and went across the road to eat broasted chicken and Jo-Jos (broasted potatoes). 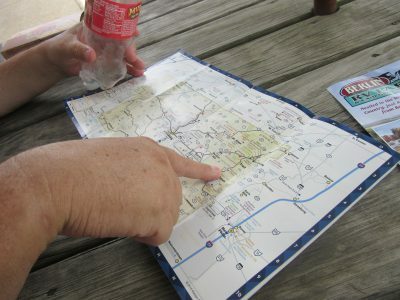 Plotting our driving route using the map we were given. Oh. My. Gosh! 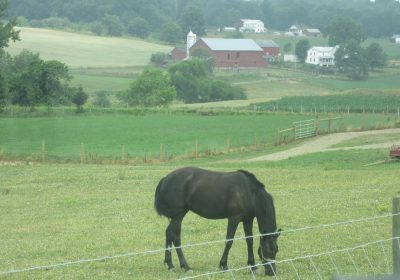 How beautiful the country side and farms are here. Pictures do not do it justice, but I’ll share a few so you get the idea. 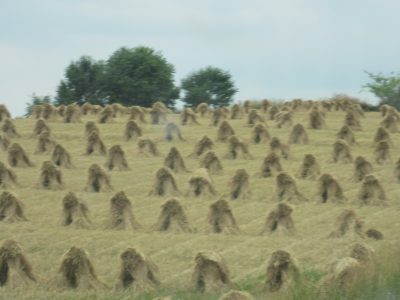 I could easily live here (at least times other than winter). 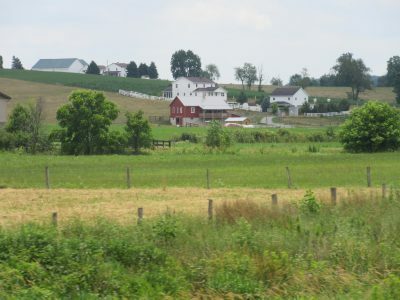 We actually spent the better part of two days driving through the country and experiencing small towns in the area. 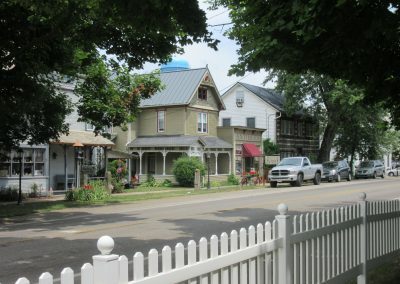 In the afternoon of our first day, while making a stop at an ice cream shop in Winesburg, Ohio, a chance encounter that relates to the photo below, led to a serendipitous moment that Jim tells about HERE. 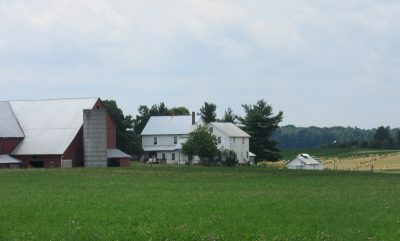 Anything and everything you could want to purchase or have made or done is available in the area. 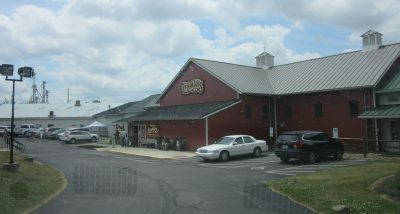 We stopped into one Amish furniture store (Jake’s Amish Furniture in Orrville, OH) and at one roadside market. In town, we ate at Der Dutchman restaurant and picked up some chocolates. It was the most relaxing and enjoyable experiences I could have dreamt possible!